Artist David A. Hardy's view of Pluto and Charon showing the possibility of haze, clouds and even cryovulcanism. Sophia Nasr is a science writer for Simulation Curriculum's free Pluto Safari app. She is an astrophysics student studying dark matter at York University in Toronto, president of the university's astronomy club and a member of the York University Observatory team. She contributed this article to Space.com's Expert Voices: Op-Ed & Insights. You might guess that a small and distant world almost 40 times farther from the sun than the Earth is from the sun would not have an atmosphere, but in the case of Pluto, you'd be wrong. In fact, Pluto is a complex world, particularly when it comes to weather patterns. Gusty winds, clouds, haze, micro snowflakes and even ice volcanoes — cryovolcanism — could all be part of Pluto's dynamic weather system. While such observations have come from Earth-based telescopes, many more surprises might be revealed as NASA's New Horizons spacecraft makes its nearest approach to Pluto on July 14, 2015. But no matter how you classify it, this icy and remote dwarf planet is an odd little world. Though Pluto was discovered by Clyde Tombaugh in 1930, it wasn't until 1988 that scientists first detected an atmosphere on the dwarf planet during a stellar occultation. In a stellar occultation, a body such as a planet passes in front of a relatively bright star, and measuring the gradual dimming of starlight during such an event, scientists can amass a wide array of information about a planet, including its size, whether it has rings or if an atmosphere is present. Having theoretically worked out that Pluto should have an atmosphere, scientists set out to find it. "When the 1988 stellar occultation occurred, scientists were out to detect the atmosphere, which had been expected on theoretical grounds for more than a decade," Alan Stern, New Horizons principal investigator, said via email. The June 9, 1988, stellar occultation by Pluto provided the first opportunity for astronomers using telescopes located in Australia, New Zealand, and the Kuiper Airborne Observatory flying over the ocean south of the Samoa islands to detect an atmosphere on the dwarf planet. If an atmosphere on Pluto were not present, starlight would blink instantly off and then back on again at the end of the occultation. However, for a short time at the start and end of the occultation, Pluto's atmosphere was backlit by the star, and the starlight dimmed more gradually. By modeling how the atmosphere refracted, or bent, the starlight, researchers detected that Pluto has a thin layer of atmosphere made of gaseous forms of the ices — nitrogen, methane, carbon monoxide and traces of others — that cover its surface. "The occultation light curve shows a structured decline in intensity rather than a precipitous decline indicative of an atmosphere surrounding Pluto," said Paul Delaney, a senior lecturer of physics and astronomy at York University in Toronto. When astronomers graph the light data, a careful look at the gradual dimming of starlight shown in the occultation light curve reveals a "slight bend," or "kink." You can also see from the light curve that starlight does not penetrate all the way to Pluto's surface. Starlight did not reach the surface, suggesting that obscuring clouds and/or haze might mask the surface. "The symmetry and structure of the occultation light curve is suggestive of an atmosphere with structure, in comparison to the absence of an atmosphere surrounding Pluto," Delaney noted. Hence, the presence of the same kink on either side of the curve suggests there is an atmosphere engulfing Pluto, he said. The most recent Pluto occultation opportunity was on June 29, 2015, in the southern hemisphere, just two weeks before New Horizons makes its closest approach to the Pluto system. The only observatory able to position itself directly in the center of Pluto's shadow, located off of New Zealand, was NASA's Stratospheric Observatory for Infrared Astronomy (SOFIA), a Boeing 747SP jetliner modified to carry a 100-inch-diameter (2.5 meters) telescope. "SOFIA observations of Pluto demonstrate a capability to make detailed measurements of Pluto's atmospheric density and structure," said Pamela Marcum, SOFIA program scientist at NASA's Ames Research Center. "SOFIA conducted its first occultation observation, also involving Pluto, in July 2011. This flight adds to our understanding of how the atmosphere of Pluto evolves over multiple-year time scales as its elongated orbit takes it farther away from the sun." The comparative sizes of the atmospheres of Pluto and Earth. Once the existence of Pluto's atmosphere was confirmed, scientists began to investigate how the atmosphere and the surface temperature change during Pluto's 248-Earth-year journey around the sun. The orbit of Pluto follows a highly elliptical orbit that resembles a squashed circle. In fact, its orbit is so elliptical that during perihelion (its closest point to the sun), Pluto is only about 30 astronomical units (AU) from the sun, bringing it closer to the sun than to its closest neighbor, Neptune. The large 20-AU difference between Pluto's perihelion and aphelion distance results in interesting chemistry on Pluto's surface and in its atmosphere. Pluto is a rocky body covered in ice. At perihelion, Pluto's surface temperature increases to about minus 220 degrees Celsius (minus 364 degrees Fahrenheit), allowing the ice on its surface to sublimate — that is, transition directly from a solid to a gas. The resulting vapors form a layer of atmosphere made of molecular nitrogen (with trace amounts of carbon monoxide and methane). Scientists originally thought that as Pluto recedes from the sun, and the temperature decreases to about minus 240 C (minus 400 F), the vapors freeze and fall back down to the dwarf planet's surface. However, observations made as recently as 2013 and coordinated by the Portable High-Speed OccultationTelescope group from multiple sites including the 0.9 m astrograph at Cerro Tololo Inter-American Observatory (CTIO) and the 1 m Liverpool Telescope on the Canary Islands, indicate that Pluto's atmosphere is not collapsing, but rather thickening. So, although Pluto's atmosphere gets thicker and thinner through its orbit of the sun, it may never completely freeze out and "collapse." Michael Summers, New Horizons co-investigator and member of the atmospheres science theme team, said it's too early to tell whether Pluto's atmosphere freezes out or persists through its orbit. This makes sense, as Pluto has made only one-tenth of an orbit around the sun since the discovery of its atmosphere in 1988. Summers used a tangible analogy to explain what may be happening — one that we see daily on Earth. "There is a time delay between the highest temperature and the maximum heating. … The maximum heating from the sun during the day is when the sun is directly overhead, at noon," he explained. "But the highest temperature usually occurs later, around 2 p.m. in the afternoon. The Earth continues to heat up from noon to 2 p.m. That is due to a thermal lag; it takes less time to heat up the atmosphere than it takes for it to cool off. "I think, for Pluto, it just takes time for it to cool off," Summers added. "In fact, it may still be heating up, sort of like we are still in the Earth's, say 1 p.m., time frame for Pluto." Another interesting fact about Pluto's atmosphere is that it evolves quickly. Work by a team led by Jane Greaves, an astrophysics researcher at the University of St. Andrews in Scotland, shows that the carbon monoxide density in Pluto's atmosphere has increased in just a decade. Additionally, Greaves' team found carbon monoxide extending out to more than 1,860 miles (3,000 kilometers) from Pluto's surface. The molecules that reach such extents will likely escape, as solar winds will just carry them out into space. When New Horizons arrives at the Pluto system, onboard science instruments such as Alice, a sensitive ultraviolet imaging spectrometer, will reveal even more about the composition and structure of the dwarf planet's dynamic atmosphere. Continued observations of stellar occultations of Pluto will show us whether its atmosphere freezes out. Pluto last reached perihelion in 1989, and it will not reach perihelion again until 2237. Therefore, if its atmosphere does freeze out, scientists won't observe this until somewhere around the year 2200. The presence of an atmosphere dims a star's light more gradually, as can be seen in this image of Pluto with an occultation illustrated for context. At a distance of 30 to 50 AU (compared to Earth's 1 AU) from the sun, there is no doubt that Pluto is frigid. But the composition of Pluto's atmosphere makes the story a little more interesting, thanks to the presence of methane. "The temperature of the atmosphere increases rapidly with altitude above the surface due to heating of the atmosphere by methane, which absorbs infrared radiation from the sun," said Summers. Methane is extremely effective at absorbing heat, which is why it is such a potent greenhouse gas on Earth. The amounts that are in Pluto's atmosphere are enough to absorb infrared radiation (heat) from the sun and warm the upper atmosphere. This causes a temperature gradient on Pluto, resulting in temperatures increasing with altitude up to minus 173 C (minus 279 F). There is also a pressure gradient, with pressures increasing with higher altitudes. Pressures range from about 20 microbars on Pluto's surface, and decrease with altitude, to about 3 microbars. The pressure continues to decrease with altitude until it reaches the vacuum of space. For comparison, the atmospheric pressure on Earth at sea level is 1,000,000 microbars (or 1 bar). The interaction between hot and cold air, as well as variations between lower and higher pressures, creates winds on Pluto that increase during perihelion. It's not the vertical temperature and pressure gradients, but rather horizontal ones, that cause winds on Pluto. "Neither the vertical temperature gradient nor the vertical pressure gradient drive winds, at least directly," Summers said. "It takes horizontal gradients in either direction to drive winds. You can get horizontal pressure gradients from uneven distributions of molecular nitrogen (N2) ice, and you can get horizontal temperature gradients from uneven heating from the sun. Both of those are likely to drive winds on Pluto." These winds, in turn, help redistribute ice throughout Pluto's surface. Angela Zalucha, a scientist with the SETI Institute, has estimated wind speeds on Pluto to be as low as 23 mph (37 km/h). However, some climate models that use the same algorithms as those used for Mars (performed by Zalucha and Amanda Gulbis, a planetary scientist at the Massachusetts Institute of Technology) suggest they may be as high as 225 mph (360 km/h). "Those winds are about 100 km above the surface of Pluto," Summers said. "At those altitudes, there is no planetary boundary-layer friction with the surface (meaning, the surface terrain does not exert a frictional drag on the wind moving above it), so high-speed winds might be possible. That would be far above where any clouds could possibly form. At even higher altitudes, the escape velocity outward from Pluto even becomes supersonic. So, in Pluto's upper atmosphere, some rather high-speed winds are possible." Those conditions would be similar to those in Earth's atmosphere, where wind speeds increase with altitude. But Summers cautioned that researchers' uncertainties about Pluto's wind speeds are quite high. "We don't know enough about the distribution of heating and ices to calculate the wind speeds," he said. Thankfully, New Horizons will investigate wind speeds on Pluto during its closest approach and hopefully provide more conclusive data. Even at an average distance of 6 billion km (3.7 billion miles) from the sun, solar winds do reach Pluto's orbit and beyond. While about 1,000 times less dense at Pluto's orbit than at Earth's, solar winds carrying protons and electrons, as well as ionized helium and oxygen, gust outward at about 300 to 500 km/s (187 to 311 miles/s). Both solar winds and UV radiation from the sun play a part in Pluto's atmosphere, particularly the upper atmosphere (the exosphere). "We expect that Pluto's escaping atmosphere is ionized by UV photons from the sun —sunlight — rather than the solar wind," said Frances Bagenal, team leader for New Horizons plasma investigations, of the Laboratory for Atmospheric and Space Physics at the University of Colorado, Boulder. "But once the atmospheric molecules are ionized, they see the interplanetary (solar) magnetic field and are 'picked up' by electric forces and carried away by the solar wind. As always with physics, momentum is conserved so that the solar wind is correspondingly slowed down." The last bit about momentum conservation warrants a bit of explaining. Momentum is the product of a moving body's mass and velocity. The laws of physics state that momentum is always conserved in a system, in that it can neither be created nor destroyed, but rather can be transferred between colliding bodies. (The momentum vectors of each interacting body can be added together.) When the solar winds come in and "pick up" the ionized molecules in Pluto's outer atmosphere, they pick up more mass. Therefore, speed must decrease so that momentum is conserved. Also, the reason the molecules "see" the solar winds when they are ionized is they now have a charge, and thus can interact with the magnetic field carried by the solar wind. The process, as noted by Bagenal, may also deflect solar winds around Pluto at that scale. The Solar Wind Around Pluto (SWAP) and Pluto Energetic Particle Spectrometer Science Investigation (PEPSSI) instruments aboard New Horizons will analyze the solar winds near the Pluto system. The above image shows the relatively circular orbits of most solar system planets, and the the highly elliptical orbit of Pluto. at this scale, the orbits of the inner terrestrial planets are very small, and thus cannot be seen as clearly as the orbits of the outer planets. As mentioned earlier, Pluto may also have clouds and haze, made of the very constituents of its atmosphere: molecular nitrogen, and some carbon monoxide and methane. The presence of clouds, however, is dependent on the existence of a temperature gradient, like that on Earth. "On Earth, there is what we call a troposphere, where the temperature decreases with altitude, causing water to supersaturate and form clouds," Summers said. "Above the Earth's troposphere, the temperature increases again in the stratosphere. On Pluto, there is probably not a very thick troposphere. In fact, it may be only 1 km to 2 km (0.6 to 1.2 miles) thick, so any clouds would have to be very close to the surface." And with clouds must come some form of rain or, at Pluto's distance from the sun, snow. But this snow is not the kind we see here on Earth — and not just because of its composition, but also because of how tenuous Pluto's atmosphere is. "[O]n Earth, we have a very thick atmosphere with lots of condensable water vapor," Summers said. 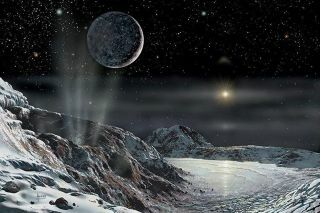 "But on Pluto, with its thin atmosphere, I think any condensed particles would be very small, perhaps microns in size, so they would probably not form as snowflakes. But they could still be regular, with hexagonal symmetry — like 'baby' snowflakes on Earth." Researchers think Pluto also may have an ionosphere and a weak magnetic field. "New Horizons can also potentially detect both an ionosphere around Pluto using REX and any (however unlikely) strong magnetic field via SWAP and PEPSSI," Stern said in an email. However, while Pluto may indeed have a magnetic field as well as an ionosphere — a place that is home to the auroras that dazzle the Earth's skies — the chances of seeing auroras in the skies of Pluto are very slim. "Aurora[s] are very unlikely because (a) it's very unlikely there's a magnetic field to focus the charged particles into a small region of the atmosphere (necessary at other planets) and (b) the tenuous solar wind is likely deflected far [10s of Pluto radii] around Pluto," Bagenal said in an email. An illustration showing the location of the Alice instrument aboard the New Horizons spacecraft. Yet another surprising discovery would be cryovolcanism — volcanic eruptions of gaseous material such as water, ammonia or methane — on Pluto. But recent observations have led astronomers to speculate exactly that. While Pluto's upper atmosphere has exhibited little change between 1988 and 2013, its lower atmosphere has shown otherwise. Pluto's light curve shows a bend near the bottom, but in more recent observations, the curve at the bottom begins to look bowl-shaped. The increasing curvature means the atmosphere near Pluto's surface is increasing in pressure, and that a haze is covering its surface. Because of these extreme changes, astronomers have speculated that the cause may be cryovolcanism. A recent paper in the journal Icarus published in 2015 by Marc Neveu of Arizona State University's School of Earth & Space Exploration and his colleagues, states that required atmospheric constituents for cryovolcanism are carbon monoxide, molecular nitrogen, methane and molecular hydrogen. If a body has an abundance of at least one of those, which requires (a) that the carbon monoxide does not get dissolved by a body of water, (b) a large amount of accumulated molecular nitrogen or (c) "reduced gases" (like methane) produced in the masses via hydrothermal vents, there may be cryovolcanism on the planet's surface. If that is the case, then Pluto may have a subsurface layer of liquid. The paper also attributes the possibility of cryovolcanism to Pluto's largest moon, Charon. New Horizons will shed light on this mystery once the spacecraft reaches closest approach to the dwarf planet. While astronomers have an idea of what Pluto's atmosphere is like, and even what weather patterns it may exhibit, once New Horizons arrives at Pluto, the instruments aboard the spacecraft will take data of its atmosphere in unprecedented detail. As New Horizons glides behind Pluto and its shadow during the flyby, an ultraviolet imaging spectrometer aboard the spacecraft, named Alice, will analyze the filtered sunlight that passes through Pluto's atmosphere. This will allow scientists to learn more about the atmosphere's composition, as well as its density and temperature. Alice will also probe for an ionosphere, a place where electrons and molecules ionized by the sun roam (potentially where auroras can form). Alice will then take a look at Pluto's moon Charon to determine if a faint trace of an atmosphere is present. "When New Horizons observes the solar occultation with Alice, the observations will tell us the composition and density of Pluto's atmosphere as a function of height," Stern said. New Horizons will help answer fundamental questions about the density of Pluto's atmosphere, its structure, its temperature, and whether its surface is indeed veiled with clouds and haze, as well as shed light on its ionosphere and magnetic field. Astronomers will get more accurate estimates of Pluto's size, and gain more insight into the wind speeds on the dwarf planet. With all of the discoveries New Horizons has already made of Pluto and its moon Charon, scientists are bound to lift the veil of mystery surrounding this distant world. With the free Pluto Safari app for iOS and app for Android, users can simulate the July 14 flyby of Pluto, get regular mission news updates and learn the history of Pluto. Follow Simulation Curriculum on Twitter @SkySafariAstro, Facebook and Instagram. Follow all of the Expert Voices issues and debates — and become part of the discussion — on Facebook, Twitter and Google+. The views expressed are those of the author and do not necessarily reflect the views of the publisher. This version of the article was originally published on Space.com.